NOTE:​ ​ ​the​ ​recipes​ ​and​ ​amounts​ ​are​ ​not​ ​the same.​ ​You​ ​need​ ​to​ ​watch​ ​the​ ​videos​ ​to​ ​understand​ ​the​ ​process. 2. Read over and complete abbreviations and kitchen tools needed for lab on Thursday. Food lab #1 to be completed in your table teams. Follow all specific job duties on your job duties/reflection handout. ​For head and sous chefs, follow the recipe as written. All info needed is below on the attachments. Review recipe and food lab specifics for tomorrow. See handouts below to read, view videos and study over job duties for the lab. *Today you will finish the table manners and table setting activity. *Please complete the careers in foods and nutrition handout and look over the food lab jobs and food labs planned for next week. Check words or concepts you know. Circle words or concepts you DO NOT know. Be ready to write down & share 2 things you learn from each link above. Be ready to share 3 things you learned from each LINK above. Complete review packet for Kitchen safety and sanitation quiz on Friday. Be ready to present to your team your KITCHEN SAFETY POSTER Tips you learned last week. See handout below. Share your findings with your table mates. Solve the 4 case files using the attached handout. Complete the Kitchen Safety Team Project. Continue and finish introduction in to kitchen safety and sanitation with the handout below. 2. Review for Quiz #1 on Tuesday. Friday 9/22/17 - CatchUP day! 2. Complete and turn in any assignments not completed and turned in. 3. Begin to review for quiz on Tuesday 9/26/17. Thursday 9/21/17 - No school - teacher workday. Today you will do a web quest on fast food restaurants. Go to the following link to be able to research fast food nutrition facts. help to put your whole meal together. Follow the link to kidshealth.org website, read the three sections about about food labels. After reading, watch the 4 minutes video and answer the questions pertaining to the video. It is okay to stop or pause the video when the answers are given. Follow the link to kidshealth.org website, read the 1st two sections about "Go, Slow, Whoa Foods". Answer the 4 questions about "go, slow and whoa" foods. 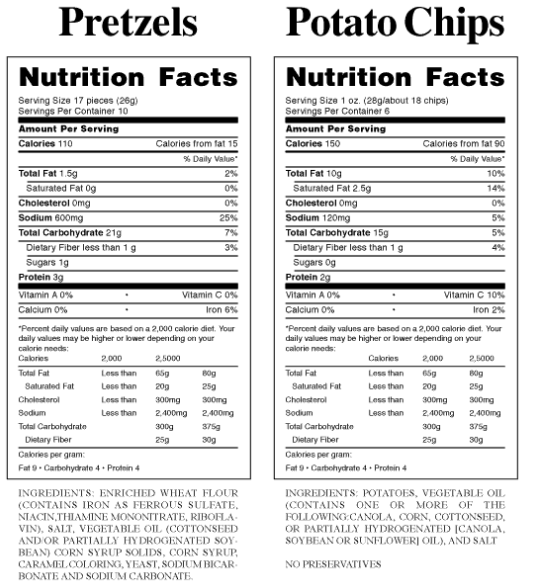 See picture below of the nutrition labels. What is on the back of a box or bag of food? Do you know? *using textbook (Adventures in Food and Nutrition), complete handout below. Research and learn more about the 6 essential nutrients to create a tri-fold brochure or power point. Finish your research from Monday & Tuesday using handouts provided. You choose how you will present your research. Create a brochure using Microsoft publisher. Project due by the end of class. Monday 9/4 - Happy Labor Day! Continuing assignment above from Tuesday. Finish and turn in MY PLATE project above from Tuesday. 3)Reviewing both definitions what do you think the elective Nutrition and Wellness will be about? 1) Complete the Teen Wellness Assessment- Teen Compass. Be sure to add up your score on each page. 2) Complete the Wellness Wheel (please use a pencil/color pencil to shade in the wheel) with your results. 1. After you complete the Wellness Assessment, analyze your results and make a plan to balance your wellness wheel. ​2. Complete the ZGTMMS FACS Website Scavenger Hunt activity. 1. Complete the ZGTMMS FACS Website Scavenger Hunt activity.